We pride ourselves in providing our customers with quality insurance to sports boats and powerboats at highly competitive rates... why pay more for less? What's more you can get a quote now and be insured in minutes, but you can still guarantee a fast and effective UK based customer service whenever you need us! UK only staff, no automated calls and no junk mail! 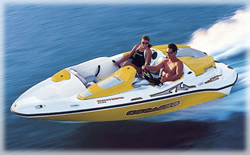 Speedboat/ powerboat/ sports boat insurance are three particular specialisms of ours. As a result, not only do we offer a great insurance products we're confident our insurance rates are highly competitive (so much so if you beat one of our quotes we want to know about it)!